This is a solid issue, that could stand alone. 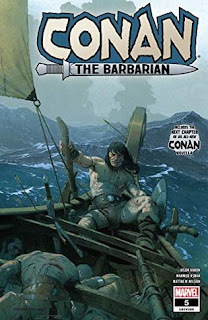 The inside flap blurb covers the progress and summarizes the approach to the series so far: each issue captures Conan defying death in a different part of his life across the globe. The art is great, the story consistent, battles fun, creatures weird, and it even has some a few, subtle call-outs to the Belit and Savage Sword series content. Great stuff. But, it is part #5, and we hardly need another episode showing how much Conan defies death. I am glad that it crystallized that the idea that Conan has to enrich his sacred/cursed blood, but bring on more of the Crimson witch! She deserved more than half a page. John C Hocking's novelette "Black Starlight" continues on a good trajectory, with Conan and Zelandra (and friends) defending the Emerald Lotus from nightmarish, eldritch creatures conjured by some sorcerer.